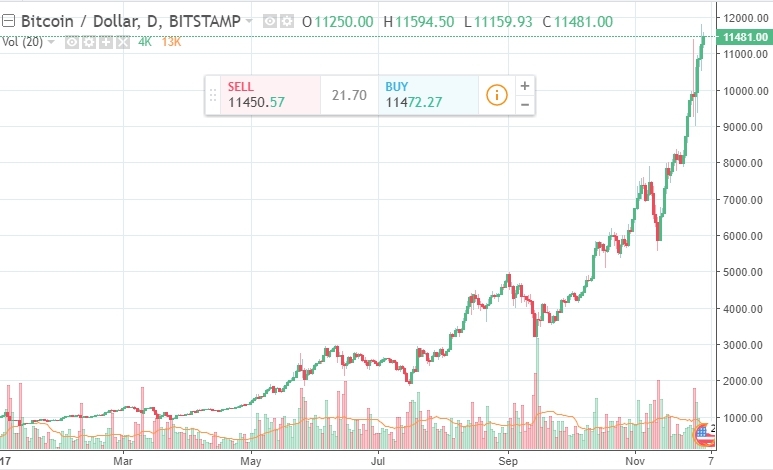 Bitcoin has been extremely volatile and setting new all-time highs one after another over the last few weeks. It’s getting harder and harder to track the BTC exchange rate since the price ups and downs are frequent and rapid. What’s the reason behind this roller coaster? The most recent roller coaster started last week after the BTC exchange rate exceeded the 10K USD/BTC threshold. Experts name 2 major reasons for the price fever around the psychological level. Firstly, it’s all about the magic of numbers. The thing is that after the price exceeded the 10K threshold, international experts slit in half over the future of Bitcoin. While some of them think this is a good springboard for future price hikes (the cryptocurrency quickly broke through 8K and 9K USD/BTC), the others believe that this psychological level will finally show international investors that all of that is another price bubble which is about to burst, FortFS reports. The second reason behind this Bitcoin drama boils down to the fact that Bitcoin has been really sensitive about related news. For instance, should The Telegraph have released a press release about tougher control over cryptocurrencies coming from the British financial regulators, Bitcoin instantly crashed by around $1000 at a time. A couple of days before, Bitcoin retraced only to start another strong rally instantly after the SEC approved Bitcoin futures (the first trading session are expected to take place on CME and CBOE Futures Exchange on December 18th). However, international experts are also divided over BTC futures. While some of them expect big-scale institutional investors to join in and push BTC even higher, the others expect those big-scale players to short BTC with the help of those futures, which will bring down the BTC exchange rate. At the same time, there emerged first Bitcoin billionaires – The Winklevoss twins.